We have so many ways to see our planet using scientific tools. The Nancy Foster, for example, uses radar to see boats and weather in the direct vicinity. The ship uses satellite images to prepare for missions and to support surface information. 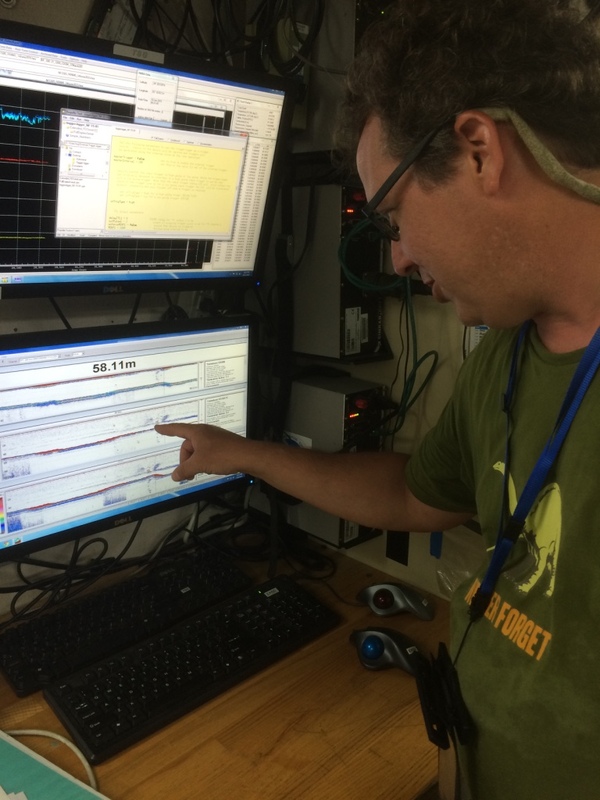 Onboard, the Nancy Foster uses sonar to measure ocean depths and detect the undersea activity of marine organisms, and map the physical characteristics of the seafloor. The ship collects hydrographic information by making repeated passes over an area of interest. This is the product. This technology all relies on our acceptance that a pixel of light with a specific value equals some tangible unit of mass or energy in our ocean. The equations and processes that help us determine the relationship between the data collected and what is meaningful to us must be worked out through careful analysis and study. In our case, we are trying to work out the relationship between certain patterns of sonar feedback and what habitat is present on the seafloor. Don Checking Drop Camera Setup before lowering down into Warsaw Hole. Don Field of NOAA’s National Center for Coastal Ocean Science calls himself a pixel-pusher. Deciphering the images and data that show up on a monitor means having an astute understanding of what each bit of data means. Part of Don’s research involves squeezing more data from the bits collected by looking for associations between these bits of light and the real world. 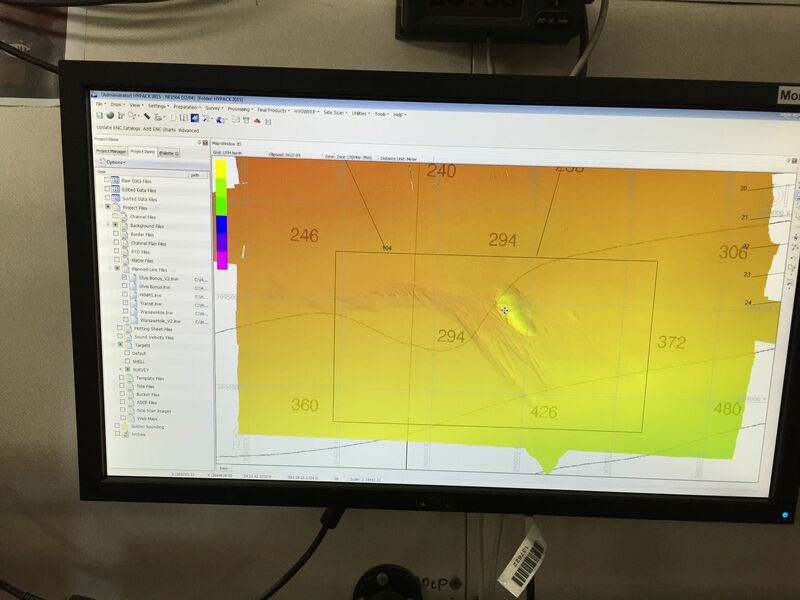 Identifying the relationship between these sonar profiles and the habitat on the seafloor means matching up pixels from a screen with what exists in the actual environment. If we can reliably identify seafloor type by sonar, for example, we could begin to quantify habitat for individual species rather than relying on approximations. Don calls this ground-truthing. 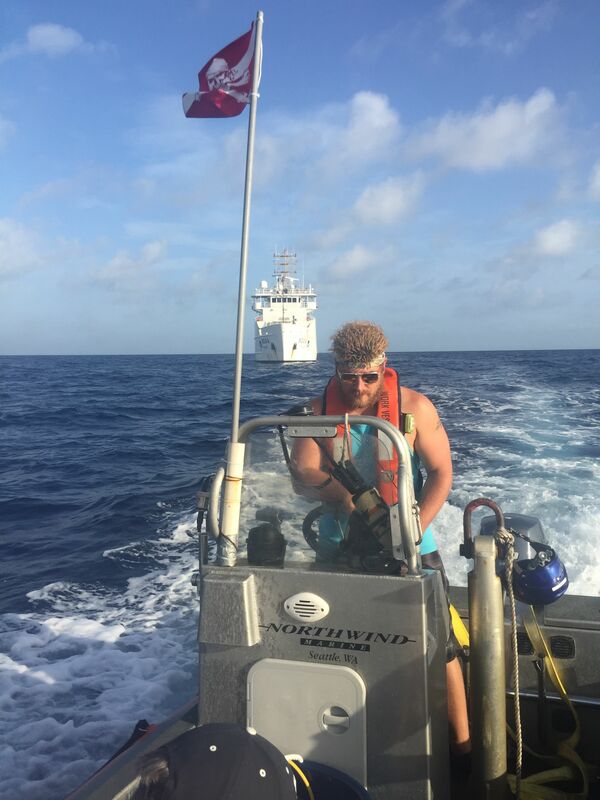 This means a researcher on the ground (or in the ocean in our case) must connect the features from satellite and sonar with images and data collected from onsite. 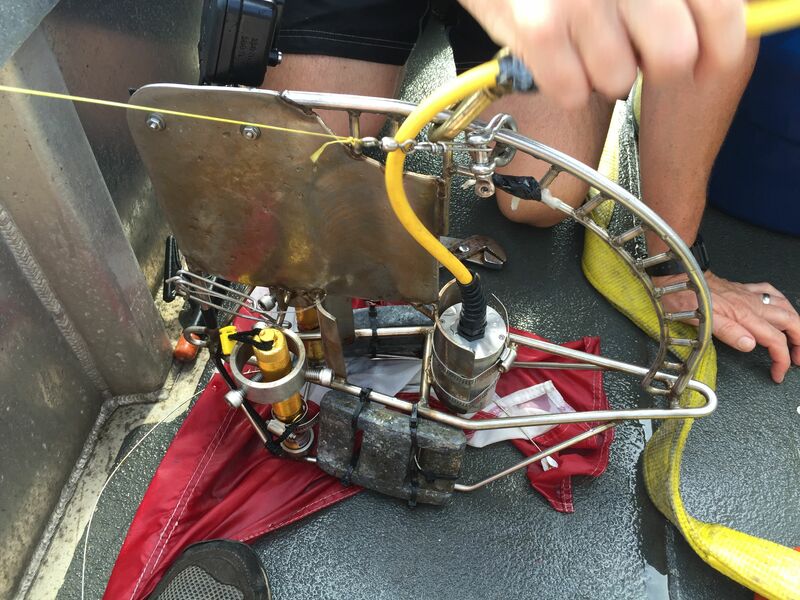 Our project on this mission involves deploying a drop camera from one of our small vessels and determining what is there. Several coordinates are chosen from sonar and satellite pictures. These coordinates are entered into the GPS of the small dive boats allowing us to pinpoint the exact location within just a few meters. The drop camera is a fairly self descriptive term. This is a specially designed black and white camera that is deployed from the side of the small vessel. The camera is mounted within a protective cage with weights attached to facilitate its trip to the bottom. While the turbidity of the water is very low, light is still limited at deeper depths. The camera has lights that enable viewing in low light or during nocturnal missions. The reason we use a black and white camera is that they can operate in much lower light levels than color cameras. Think about your own color vision and how it diminishes as the sun goes down. This is our drop camera. The two brass devices attached to the left are for lasers which allow the operator to determine depth as well as relative size of objects in the field of view. 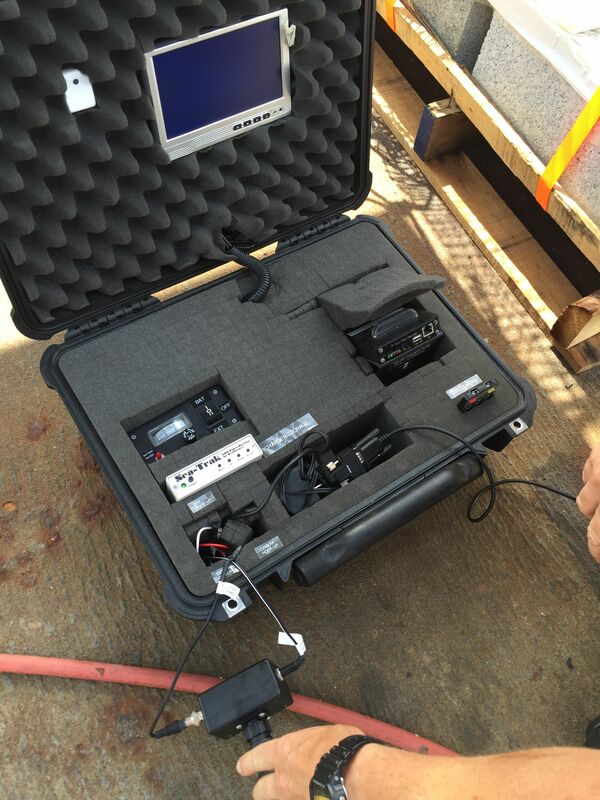 The camera rig is tethered to the GPS and video recorder with a 300 foot long coaxial cable. This cable is specially designed for this application with corrosion resistant terminals and kevlar sheathing along the entire length. We also attached a downrigger to the camera apparatus to reduce the wear and tear on the cable and to speed retrieval of the unit. On board, we monitor the camera as it is lowered almost to the sea floor at each chosen coordinate. Our equipment records and geotags the video with the exact location so it can be aligned with mapping data back in the lab. The controls of the drop camera. On the drop camera, we also utilize a fairly “off the shelf” GoPro camera. 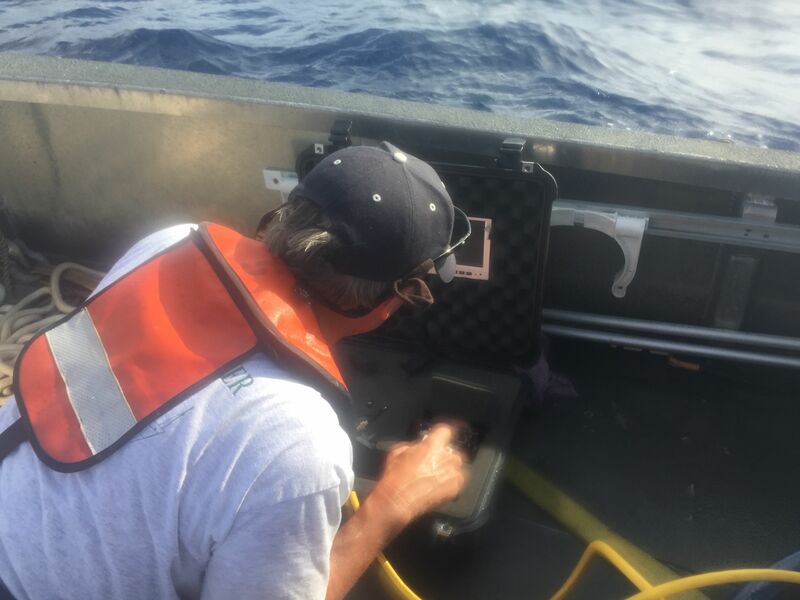 This camera doesn’t feed information back up to the vessel and isn’t connected to GPS but it can provide other useful information about the species encountered along the trip down. This biological information can be used for other projects and adds to the overall value of the mission. One of the critical things for all field scientists is to check the functioning of gear before heading out. Don and I set everything up in the drylab and on deck. There were several bugs to work out of the procedures before heading out to our first coordinates. Once we addressed the issues we had with the equipment, our dropcam was ready to go. Heading out to Warsaw Hole with our drop camera and equipment. We headed out to the locally famous Warsaw Hole. This spot is known for spawning populations of several important fish. We wanted to determine if the seafloor with in this structure held any clues to why it was so important to fish. At over 300 feet deep, this area is not conducive to exploratory dives. This inaccessibility made it a good candidate for our mission. After heading out to the coordinates we unpacked the camera, GPS, and computers. There was a sudden loss of power to the camera. A little trouble-shooting and we determined it was the fuse. Saltwater is tough on electronic components! A blown fuse was not one of the things we prepared for the day before. We radioed the ship with our fuse requirements and after a short shuttle back to the Nancy Foster, we were back in business. What could be in the mysterious Warsaw Hole? At 100 feet deeper than the surrounding seafloor, what was it about this place that encourages aggregations of the Warsaw grouper (Epinephelus nigritus)? As the camera was lowered deeper, we were able to see everything in the water column as it swam to one side or the other. We reached our destination depth and discovered that Warsaw Hole is a plain, ordinary sandy bottom. In the world of science this unexceptional discovery is called “zero data”, but it is valuable information nonetheless, as we try to characterize all of the habitats in the area. The Dry Tortugas is one of the most out-of-the-way National Parks in the US. This former Civil War era fort and the surrounding small keys are a paradise of colorful fish and raucous colonies of seabirds. While the camp site was busy, it was definitely not crowded after the Key West ferry had gone home for the day. If you decide to spend the day or camp over night, bring water. It is named for the fact that there is no fresh water! We were able to snorkel almost entirely around the fort. The submerged walls of the old fort are encrusted with corals, sea fans, annelids, and sponges of every shape and color. The remnants of former building materials are almost unrecognizable as human detritus, instead housing a great diversity of interesting reef organisms. Unfortunately, we did not see the infamous crocodile. Tick Tock. 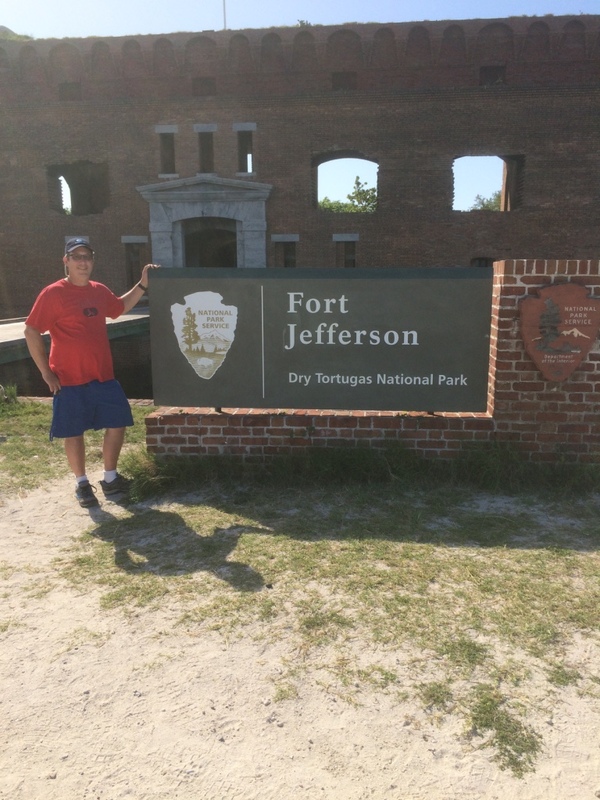 Here it is official as I stand in front of the Fort Jefferson – Dry Tortugas National Park Sign. This entry was posted in 2015, National Marine Sanctuary, NOAA Ocean Service, NOAA Teacher at Sea, William Henske and tagged Don Field, Drop Camera, Dry Tortugas, Fort Jefferson, Nancy Foster. Bookmark the permalink. You won’t find it there for sure. It is only .25 km^2 and 300 feet below the surface. It is south of the Marquesas Islands between Key West and the Dry Tortugas. It is fascinating to me that there are these features of Earth that are so extremely important to some organisms. Of course, fishermen in the area have been aware of it for a long time which is why the status of the Warsaw Grouper is uncertain. Grouper are Souper. We live on the large white boat called the Nancy Foster. The little orange boats are called dive boats and shuttle us to our research sites and to and from land when necessary. The real question is how many sandals have you have found? This is a strange world unlike the depths of the 11 Point River. We have found 1 styrofoam cup, a mylar balloon, a few lengths of fishing line, and, while snorkeling around Fort Jefferson, some historic cannons.